Sure, you'd be hard-pressed to improve upon our canine companions' lovely au naturel appearance. But there are some occasions, especially for owners of those more shed-prone dogs, when letting a pup's furry flag fly unfettered really isn't so convenient. 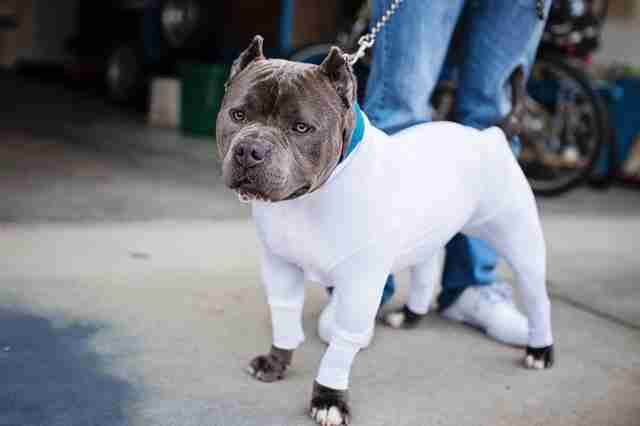 Fortunately, someone came up with an idea to prevent shedding in a pinch: dog-sized leotards. These rather adorable form-fitting outfits, made of lightweight, breathable material, are the brainchild of Tyson Walters, founder of the company Shed Defender. 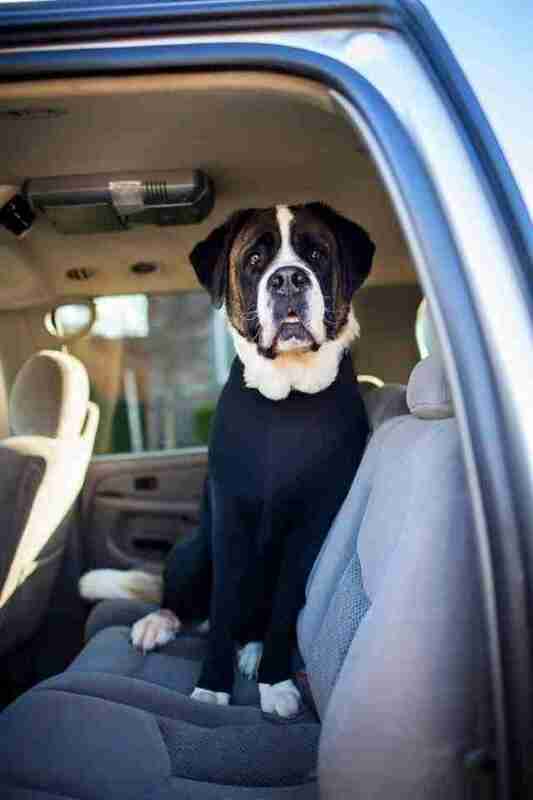 As the owner of a very furry Saint Bernard, named Harley, Walters dreamt up the garment as a fix to a very common problem he had taking car rides with his dog. "My car was practically ruined. Harley's hair would intertwine in the fabric and not want to ever come out," Walters told The Dodo. "She would shake and the hair would just explode off her and disperse all throughout the car. I looked around on the internet and dog stores, but I couldn't find a solution. So I decided to make one." 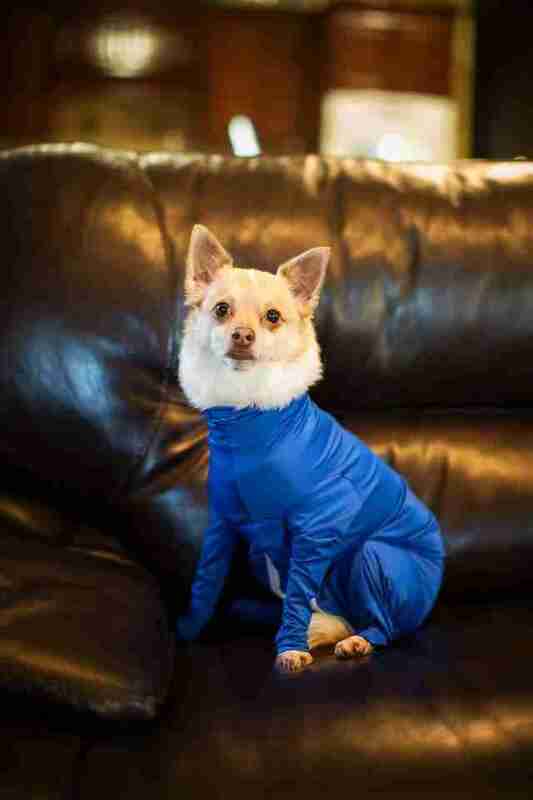 With that, the dog leotard was born. 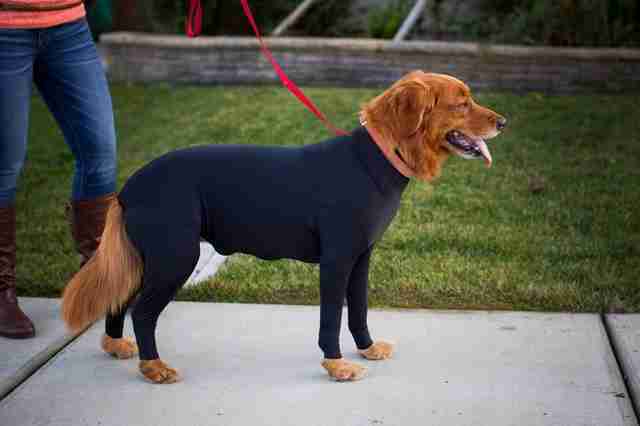 In addition to making your pup look like a little shed-free superhero, Shed Defender leotards are also a convenient solution for when someone with dog allergies drops by, as the garment reduces the spread of hair and dander to a minimum. It doesn't prevent shedding, of course. It just keeps it in check when needed. You'll still have to brush. There are several other handy applications as well. 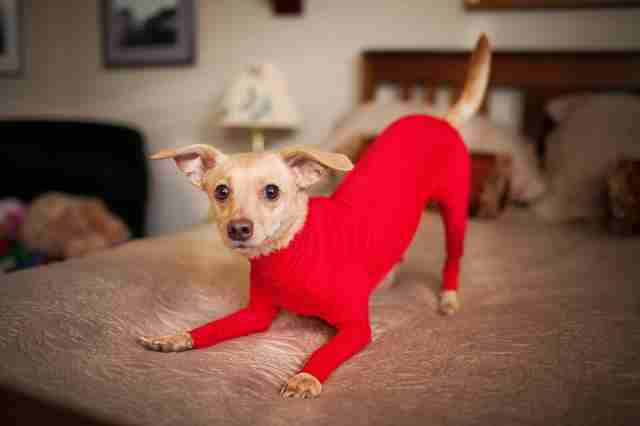 When worn outside, it keeps a dog's coat clean and, on a cold day, will even help them stay better insulated. If a dog has stitches, or some other skin annoyance, Shed Defender could even work as a replacement to the dreaded cone of shame. 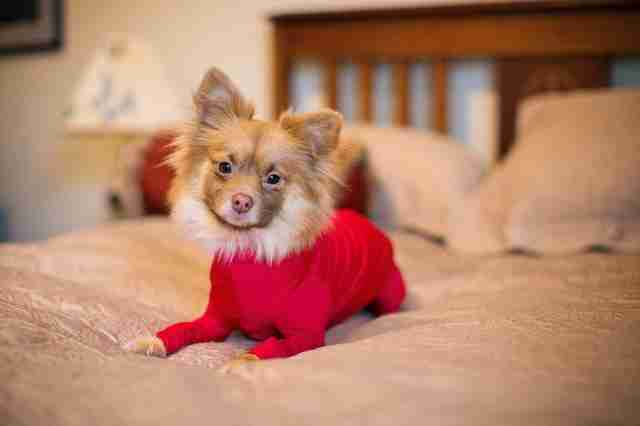 Anxious pups could benefit from the garment as well. 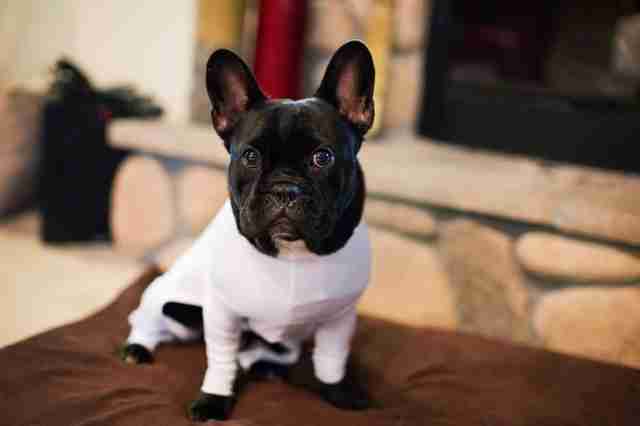 Wrapping dogs in snug fabric is said to ease nervousness during times of stress. Shed Defender is quick to note that the product is intended to be worn for brief periods at a time, not always - and that dogs should be properly brushed after using it, as is recommended to maintain a healthy coat. The fabric allows enough airflow that overheating isn't a problem (but it's always a good idea to keep a dog indoors on especially hot days, anyway). 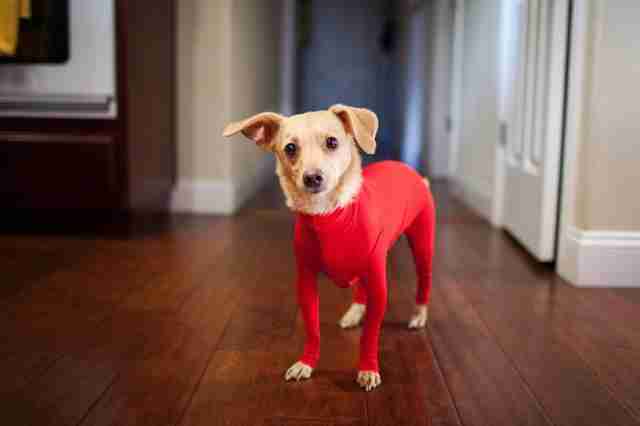 Oh, and you'll need to unzip the relevant end when it comes time for a dressed-up dog to do his or her business outside. "It is actually pretty easy to put on and very easy to take off," said Walters. "Every dog reacts differently to the Shed Defender, sometimes it can take awhile for dogs to get comfortable in any type of garment, including the Shed Defender. They might walk a little funny or pick up their hind legs when they walk, but just give it time and they will soon forget they are even wearing it." 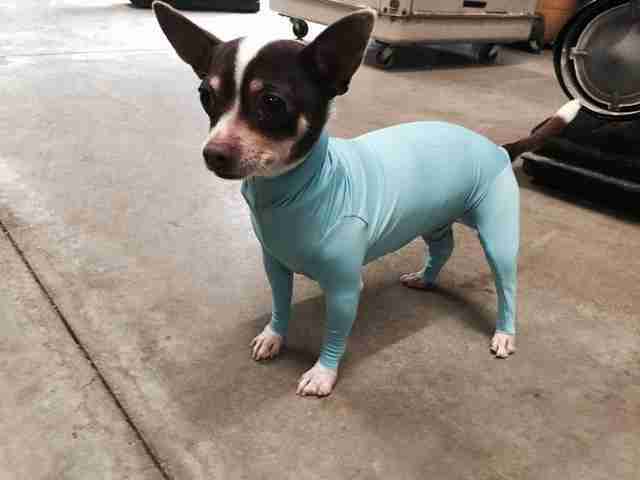 While it's always possible that some dogs might reject the idea of wearing a leotard outright, Shed Defenders hopes it will have added benefits to dogs in general either way. A portion of the proceeds of every garment is donated to local animal shelters to help homeless pets. 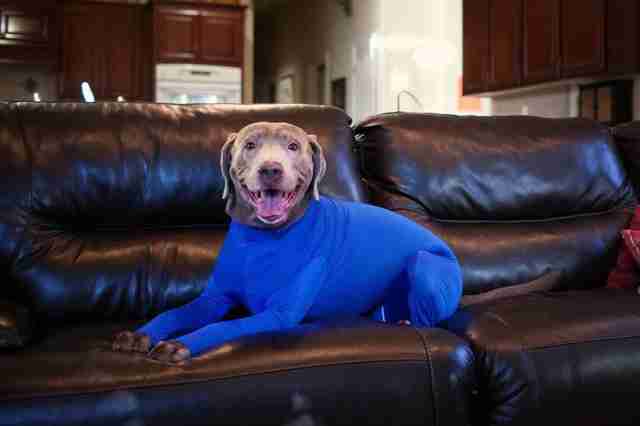 Did we forget to mention that dogs in leotards are actually quite cute? To learn more about Shed Defender, visit the company's website here.